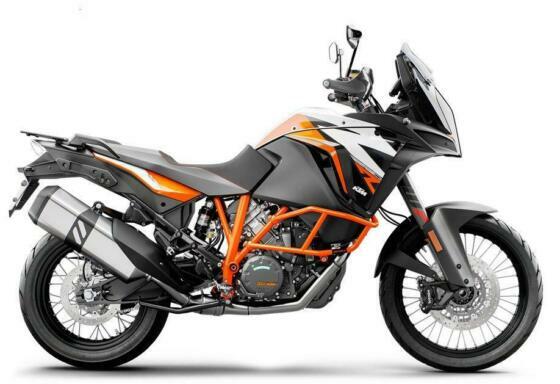 Over the £14,300 1290 S you get larger off-road focused wire spoked wheels, 20mm more travel, a 30mm higher seat, smaller sport screen with 50mm travel, one piece seat, orange frame and protection bars but 2kg is added to the weight. Or for £15,500 the 1290 T gets you a larger 30 litre fuel tank, Hill Hold Control, Motor Slip Regulator and heated grips/seats but it pushes the wet weight up to 249kg. Surprisingly for the highest price of the three versions the T doesn't get the fancy TFT dash or integrated cornering headlight. The wire spoked 21" front wheel takes a 120/70 Pirelli Scorpion Trail II tyre and the rear 18" a 170/60. Service interval is 9,300 miles. Options include a headlight protector (£74), skid plate (£233), radiator grill (£66), LED foglamps (£392), up/down quickshifter (£334), Motor Slip Regulator / Drag Torque Control (£121), Hill Hold Control (£152), panniers (£832), top case (£417), tank bag (£133), single piece comfort seat (£417), rider's heated seat (£209), pillion's heated seat (£117), Akrapovic slip-on (£835) and various Carbon bits.